Among the things that Japan is most famous for are its cherry blossom and its luxury consumers. The cherry blossom season is coming to an end but, as the stunning display of pink foliage fades and dies off, the country’s luxury sector, the largest market for brands after that of the US, is once again flourishing. Over the past decade, the explosive growth of the Chinese economy, which contrasted with the economic contraction in Japan, has attracted luxury brands around the world. Now it is Japan’s time to shine again and with it boost the luxury British sector as the typical Japanese high-end consumer nurtures a fascination for all things handmade and artisan. This resurgence has been prompted to a large extent by the marked improvement in the massive Japanese economy, which has been moving out of recession. Luxury goods group LVMH reported last year that it was seeing “an acceleration in Japan” while management consultants Bain & Company found the Japanese luxury sector in 2015 had grown by five to seven per cent, compared with one to three per cent in the Americas. 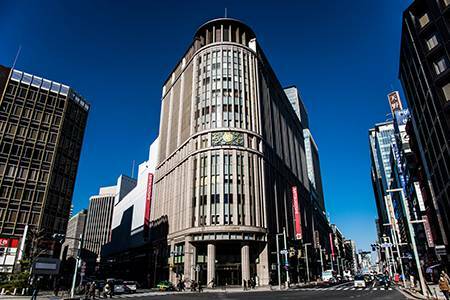 In a survey of 90 international retailers across Asia, conducted by property company Cushman & Wakefield last June, 65 per cent said they had new confidence in Japan with 45 per cent acquiring new stores or buying back existing franchises. Jimmy Choo reported in March that revenues in Japan were up by 29 per cent while Salvatore Ferragamo, enjoying a 14 per cent rise in its Japanese revenues, has just announced a major investment in the country, including the renovation of its outlets. Retail research agency Conlumino reports that the Japanese luxury sector will rise from $31.7bn (£22.5m) in 2014 to $41bn in 2019, comfortably ahead of China’s $36.8bn. Chinese consumers are thinking twice about paying to travel all the way to London to buy their luxury goods and are heading to Japan instead. 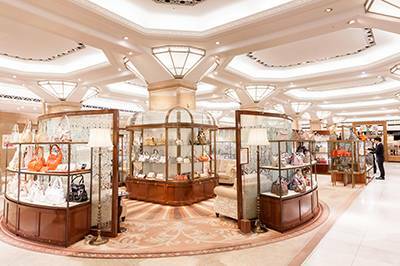 Visitors from China now account for 20 per cent of luxury sales in Japan, according to Bain. 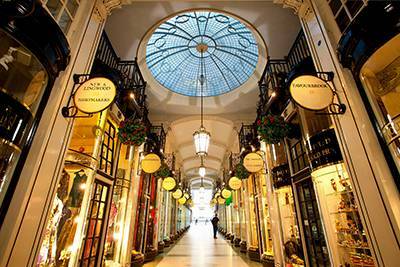 British luxury brands are making the most of this renaissance. Burberry’s CEO and creative director Christopher Bailey is focused on “unlocking” the Japanese market, he revealed recently. Burberry is taking back full control of its operations in the country by ending a licence with local brand Sanyo Shokai and doubling its store presence with the aim of generating £100m in revenues in the country next year. Meanwhile, quintessentially British gentleman’s outfitter Hackett London has just opened its first store in Tokyo, situated in the new Ginza development, with a special range of products aimed at Japanese luxury consumers. The “Made in England” collection of three suits and three jackets features fine fabrics from renowned British mills, including Fox Brothers & Co and Royal Warrant holder Hardy Minnis. Six “Made in England” shirts from globally celebrated mill Thomas Mason, which produces some of the world’s finest cotton cloths, will sit alongside two styles of ventile raincoats, both produced in London. 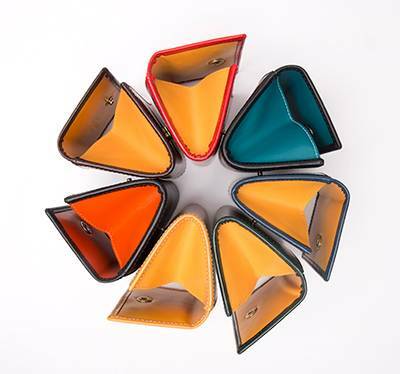 Each item has been made with meticulous attention to detail using traditional British methods and fabrics. British luxury houses looking to develop in the resurgent Japanese market will receive a boost this year thanks to a new project called The Bridge. In June 2014, Backes & Strauss, based in Grosvenor Street, invited a group of Japanese high-net-worth individuals to London to visit its showroom and the stores of other, similar luxury brands in Mayfair. The group stayed at The Dorchester hotel and visited Glyndebourne and Goodwood to experience some of Britain’s most celebrated activities and institutions. 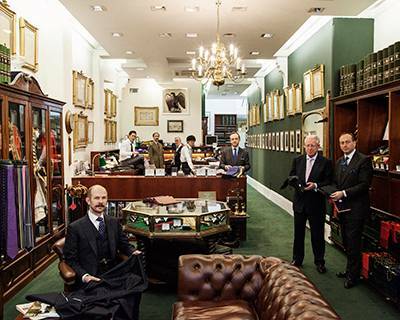 During the event, the group saw the cutters at Savile Row tailors Henry Poole & Co in action and ordered suits; the house has been dressing Japanese VIPs since the start of the last century, including the celebrated statesman Shigeru Yoshida and various members of the Japanese Imperial Family. It regularly holds overseas “trunk shows”, fittings and sales in hotels and its latest Japanese clients have often made their money in finance and IT. The Bridge is seeking to act as a conduit between Mayfair and its equivalent district in Tokyo, Nihonbashi (its name means “Japan bridge” and comes from a famous ornamental 17th-century bridge that marks the official centre of Tokyo). Like Mayfair, it’s home to celebrated luxury brands that boast excellent craftsmanship and, in many cases, a heritage stretching back centuries. In fact, Vartkess Knadjian’s opposite number and chairman of the Committee of Nihonbashi Miyuki Street is Nobuo Yoshida, a director of Ibasen, a fan-making business founded in 1590 and run by the same family for a remarkable 14 generations. In April last year, the two took The Bridge a stage further by signing up to an official Twin District Partnership. Up and coming British luxury brands are also taking Japan very seriously and are being helped in part by government-backed UK Trade & Investment, which recently arranged a trade mission there. One of those present was Alice Walsh, founder of Alice Made This, an artisan cufflink and jewellery maker whose products are available in Liberty, Fortnum & Mason and stores in Nihonbashi. Affluent Japanese consumers old and new are an appealing demographic, but they do need to be treated in a particular way, she has found. One thing is certain – as the Japanese luxury market continues to grow and the “Made in Britain” label attracts new affluent consumers from Tokyo and beyond, many more British brands will be crossing The Bridge to make the most of the exciting opportunities that arise.